THE PARKING TREES project was a temporary art installation located in Paredes. The city of Paredes is located 30 km from Oporto in northern Portugal. It has about 87.000 inhabitants, and has a strong connection to the furniture industry in the country and has developed many design related initiatives. This project was included in a local initiative, Paredes Art Open Circuit. It is comprised by a number of contemporary works of art throughout the city, mainly in the downtown area. This circuit also has a group of temporary installations, where this one was included, and it was intended to question peoplebs view and relationships with green elements in the urban environment. Studies carried throughout the city, showed a well-preserved city, concern about their citizens. The street planning, mainly focus is the well being of the pedestrian. The structuring of public space, in general, comes down to three main categories: pedestrians, cars and bikes paths and routes, however, were denoted some confusion from users, whether pedestrians, cyclists or drivers. If on one hand the pedestrian should dominate the territory, on the other hand, the space ends up being structured for the car, with parking spaces, enhancing the traffic circulation. The Parking Trees project is the occupation of a parking lot space, endowing it with characteristics of leisure for people, creating a "pedestrian parking lot". The object is a vessel design in basic shapes, simulating the look of a car. It consists of two benches at the tops and a tree at the center. It further presents two wheel shape ornaments on the sides. The selected tree, an apple tree, allows the observation of the changing seasons, because of its deciduous leaf with the emergence and maturation of the fruit during the summer. Also, this element is connected to the region and engaged in its rural character. It is further intended that the tree is the symbol and indicator of the durability of the installation, dictating its end when its fruits grow. This is a low budget structure that has been developed, in order to be built easily and quickly, having been spent just six hours, with a workforce of only four people on the spot. 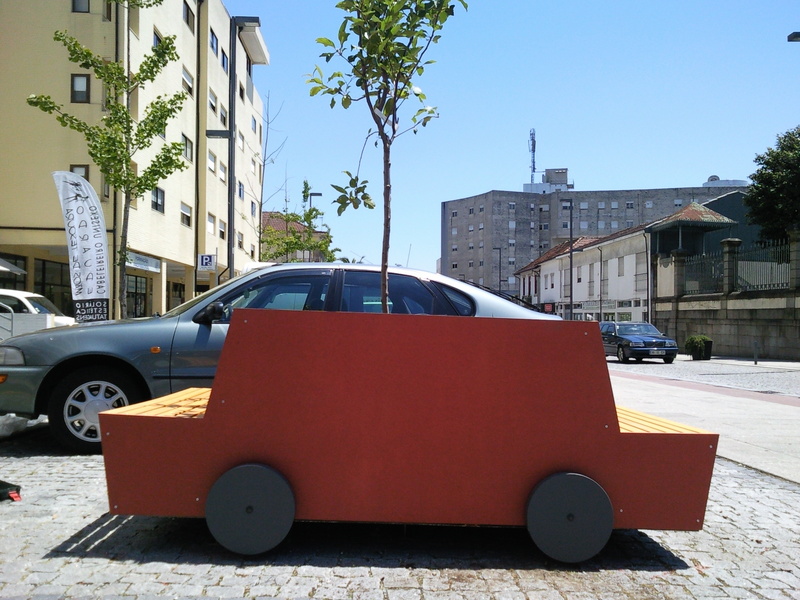 The occurrence of artistic projects involving the population and its relation to arboreal and environmental elements scarce in Portugal, decreasing recognition of the ecological importance and environmental relationship, that is generated by the merging of green elements with public space. The artistic performance process of building this type of object in public space, as well as its running time, allows the approaching of the population to the artistic intervention, involving everyday situations and praxis changing. The fact that it is a temporary element with less invasive and forceful character, as opposed to other interventions in the urban environment, allows a better analysis and greater attention by the population. This project, gave us the opportunity to review the actual categorization of public space, dominated by the automobile and accent the presence of trees in urban environment. The reception of the population to this artistic element of temporary character, allowed us to understand the importance of the involvement of the observer in these kind of initiatives. This project was part of an investigation process that is still active. It seeks to make a connective bound, between the art like an active maker of critical process and the public space regeneration, especially the use of trees and the development of an ecological conscience. JOANA PINHEIRO DE MAGALHCES is a Landscape architect who has been working in urban design, since 2008. The decaying of interventions in green spaces and the devaluing of trees in public space lead her to investigate this theme, and had finished her master degree in Art and Design for Public Space in 2013.